For Blinking Stars, I’ll be sending the instructional video by the composer as well as a backing track that I record. Both can be used to listen and play along to. For the Lesson and Writing book assignment, those are the same since we did not work on those today. The song Jungle Wedding is where he plays every “C and F” combination along the whole of the piano from low to high along with the music. The main goal here is that he learn to identify where C and F are on the piano easily. Due to the wide range of the piece, I think it’s best if he stand at the piano, rather than sit, so he can move quickly and easily. He’s becoming now familiar with all the white key names of the piano (music alphabet) and beginning to utlilize such. He needs to know that CDE are below every group of two black keys and that FGAB are below every group of three black keys. On page 76, is when he uses his first true white-key position on the piano will be C Major Position which uses CDEFG in both hands. But until then, the book has him playing some some songs focusing on just learning the white key names. 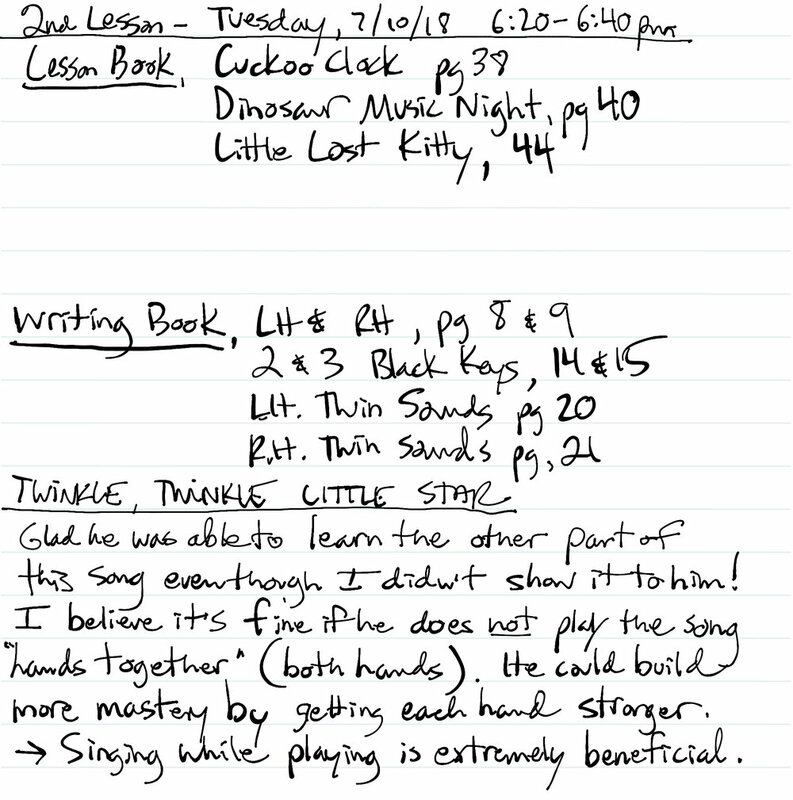 Also, I like that Wally is able to keep improving TTLS over a period of weeks as a sort of finger practice training and memorization exercise. I’d like to emphasize that he keep his hand in good position whenever he’s playing. Eventually, and quite soon, he should be able to play the whole song without mistake with both hands. Singing while playing at the same time is also very helpful. The Writing Book (mentioned above in the picture) pages only focus on Wally using finger 2-3-4 in both RH and LH. For the songs, Monsieur Mouse and Raccoon’s Lullaby, he should be able to play with the music (including repeat) with a strong tone playing the whole song correctly. It’s helpful if you can have him play it perhaps five time in a row as you and he listen to whether there were any mistakes. We then want to take steps to try to eliminate the mistake. Sorry for my lapse in getting these notes to you lately, my and student schedules have been somewhat haphazard over this summer. I’ll miss seeing you guys this week but look forward to seeing you next Tuesday! Lesson Book: For each song, he should look at the diagram above the song showing which finger numbers and keys for the “position” to play the song. (He should sit with good body posture and hand posture). The music can even be just listened to and sung to before he even plays the song on the piano. This will help him internalize how the song goes. Writing Book: The pages I assigned above are some of the simplest, yet he will need parental guidance to complete each page successfully. The instructions for each page should be fairly straight-forward. T,TLS: This song I’m having him learn by rote since his playing of this piece will then be guided by his ‘ear’ and he can focus on keeping good hand position and using the different fingers involved in playing. General: Regarding his daily practice, the important part is to let him taste the structure of trying to repeat tries so that he can keep up with the music (of course within the bounds of his overall attention span). Sometimes students, get a little frustrated when they make repeated mistakes but it’s ok to push them a little beyond their normal limit and then ease off with a little break. Then they can come back focused to build on what they learned in the previous session. Sessions of just a few minutes are ok. So then he can 2-3 practice sessions per day. Regularity is more important than practicing a lot on one day and then nothing on the following days. Lastly, if he can have a piano bench that allows the bottom of his forearms to be parallel (same plane) as the top of the piano keys. Also, if he can have his feet supported with a foot stool, he’ll feel supported. To accommodate his small size, it might take some creativity to create that situation. Sometimes, it’s ok to let his feet dangle while sitting with good posture still.